Our armadillo stuffed animals are ready to come out of their shells and make some new friends. These stuffed armadillos and plush armadillos are pleased to meet you and can 'hard'-ly wait to come to your home. A stuffed armadillo makes a great companion that will always work hard to keep you happy. Some things that plush armadillos like to do for fun include watching old episodes of Laurel and Hardy, munching on hard candy, and taking trips to the hardware store. There's no reason to live a hard-knock life when you can simply spend your days with an easy going armadillo stuffed animal. 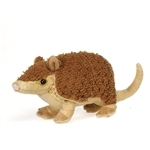 We promise that ordering a stuffed armadillo won't be hard, so scroll down and fill the soft spot in your heart for armadillo stuffed animals!